SEO is important to drive traffic to your website, but the information displayed on the results page needs to be compelling enough for a human being to want to click on the link. There is a mix of best practices that require some knowledge of HTML, but if your website is powered by WordPress, you can apply these techniques and strategies all on your own, easily. Search Engines can’t “read” images, so we need to define ALT and TITLE attributes for each image, especially if these images have relevant text in it. WordPress makes it easy for users to add those attributes right after uploading a new image using the “Add Media” button. 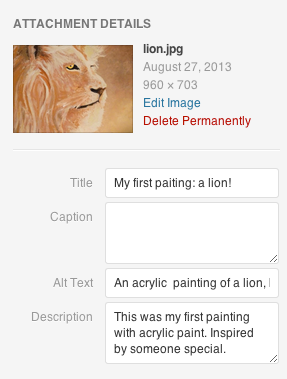 Just make sure to give a descriptive and relevant filename to the image before you upload it. WordPress Plugins are like the App Store. Think of a specific need and there will be a plugin just for that. @cintia_stela. So think of SEO and you will find several options that make implementing some techniques much easier and faster. The most downloaded SEO plugins for controlling your meta data on individual pages and posts are All in One SEO Pack and WordPress SEO by Yoast. That will allow you to write the Page Title and Description for each of your pages/posts (which will appear on Google’s Search Results) – so you can get creative and write something that interests your audience to click on your link. The most powerful tool in your search engine optimization strategy is content. WordPress makes it easy for you to write and edit text, add images and embed videos, as easy as writing an email. Integrate your current website into the WordPress platform, and be able to change the content of pages, write blog posts and engage your audience to leave comments. The Content Editor is super easy to use. When writing content, you can also use Keyword Suggestion Tools which help you choose the most appropriate keywords according to your website content. There are paid WordPress plugins that do that, but also some free options like Google AdWords Keyword Planner and Wordtracker. Remember to use your keywords naturally, so it doesn’t sound awkward, and to focus on one primary keyword per page. Linking to pages of your own website (internal links) helps both search engines and human readers to find relevant content on your website. The Insert/Edit Link tool in WordPress makes it easy for you to add internal links that point your readers to more information within your own website. But if the link you are sharing is to another website (external link), you can simply choose to “open the link in a new window or tab” and you will make sure your website will remain opened while the reader is looking at the referred website. Installing Google Analytics for WordPress will provide you with helpful data about website usage and traffic. Go to Google Analytics to set up a free account and enter the tracking code on the Google Analytics plugin settings. Pronto! You can link content that you publish on a specific domain (such as www.yourdomain.com) to your Google+ profile. That will display your photo, byline and “more by” link on the search results page. You just need to add the link to your Google+ profile into your WordPress user profile page. You can use the Google Structured Data Testing Tool or refer to the Google Authorship page for more details. Creating great, unique content with the reader in mind is the main strategy for search engine optimization, and it has to be done continuously. Having a WordPress website and blog will allow you to get hands-on, and become a contributor of value, which gives you credibility and connects you to your readers and clients. What is your favourite WordPress feature? Please leave a comment and share your tips for optimizing your SEO with WordPress. (I am sure there are lots of other tools!) And if you have any questions about using or setting-up WordPress, leave me a comment, or send me an email at [email protected].